The early decades of the twentieth century witnessed the migration of portions of the Eliashevitz and Krelitz families of Yurberg, Lithuania and the eventual settling of that family in the midwestern U.S. cities of Detroit, Milwaukee, Minneapolis, and Chicago. The reasons that the migrants came to America, and the unfortunate consequences for those who didn't, are amply documented elsewhere in the Family Book. It was a youthful and vigorous family that made the voyage. A less energetic family likely could not have made the transition to a new life in a strange new land. And strange it was. The odyssey took nearly thirty years in a land of red rocks, towering virgin forests, deep ice and snow, and rib-cracking cold. The inhabitants of that land spoke many strange tongues, they had curiously straight yellow-white hair, they ate forbidden foods, and they had many curious customs. The land was called "Mesabi," an Ojibwa Indian word for "giant," and it proved to be a giant transition for the descendants of Hillel Naividel. The Mesabi Iron Range in northern Minnesota was opened in 1892 to harvest a vast expanse of rich hematite ore. It is the largest of three iron ranges in Minnesota and, in its heyday, accounted for one-quarter of the world's production of iron ore. The range is perhaps 70 miles long and 40 miles wide running east to west. The mines were enormous open pits of red hematite ore. The walls of each pit were ringed by a great spiral of railroad tracks descending into the abyss. During the warmer months, when the mines could be worked, dynamite charges were set to blast the ore free. Huge steamshovels scooped up the ore and piled it into rail cars to be shipped downhill sixty miles to Duluth. There the hoppers were discharged from specially constructed ore piers onto ships bound for the blast furnaces of Gary, Indiana and Pittsburgh, Pennsylvania. As mines were worked out, new mines were opened at other points along the range, and new mining camps sprang up. Some of these camps were destined to become incorporated towns, and some have persisted to this very day. The mine at Hibbing was so successful that, as the pit expanded, it ran headlong into the town itself. The entire town was moved to make way for the mine. 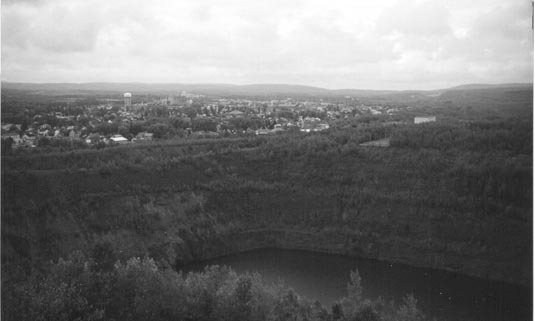 The picture above right shows a huge abandoned pit mine in the foreground partially submerged with the town of Virginia, MN in the background (taken July 1998). The mines were operated by huge concerns like United States Steel. They needed a robust work force for an arduous and dangerous job in a remote wilderness previously populated only by Indians and wild beasts. They recruited young men mainly from Scandinavia and the Balkans. The population of the camps was said to be 90% male. They worked long shifts separated from their families for months or years. Naturally, paydays could be wild and boisterous occasions that were often good for business. Among the early settlers on the range were a small number of Jewish merchants who came to fill the miners' needs for food, clothing, and household goods. Among these men and women were those with names like Ellis, Ladin, Loceff, Lippman, Bernstein, and Bankman. With the nearest large city sixty impassable miles away, the miners depended upon the local merchants for their supplies. Without these businesses, the miners would have been at the mercy of the steel companies for both livelihood and provisions. Today the land that comprises the range is a band of low hills of elevation 300-500 feet that is pitted by huge crater-like mines and studded with mountains and mesas of rubble tailings. At least one of the worked out mines (Kinney) has been reclaimed as a recreational lake, though on a visit in July 1998, no actual people were observed recreating. Originally covered with white pine virgin forest, the timber has been substantially cleared for mines, roads, towns, construction, and not least, for firewood to heat homes and to power trains and steamshovels. Mary died Nov. 14, 1934, at age 85 and is buried in Detroit in Chesed Shalom Cemetery on Gratiot Ave., Mt. Clemens, MI.(Detroit). Her death certificate might reveal the maiden name of her mother. The vanguard of the Naividel descendents in America was George Krelitz who opened a business in Altoona, Pennsylvania and is more fully discussed in the Family Book. Altoona was an important stopover on the way to the iron country. Sam Ellis became the first of the Naividel family living on the range to become a naturalized United States Citizen in 1902 (1920 U.S. Census) and the first Naividel to live on the range when he moved to Eveleth, Minnesota in 1903 and opened a general store. Harry Ellis, Celia Krelitz, and Rae Krelitz arrived in New York on August 4, 1903 on the liner Kronprinz Wilhelm, having departed from Bremen, Germany. An interesting finding from the 1920 Census data is that Sam and Rae were both listed as naturalized United States citizens as of 1902. Remember that Rae did not arrive in the states until 1903. In those days, women held the citizenship status of their husbands. Women did not file citizenship petitions. Therefore, when Sam became a citizen in 1902, it entitled his wife to retroactive citizenship when they were married in 1903. The census indicates that Shalby (1909) was the first of Sam and Rae's children to be born on the range. Sam was listed as residing in Gilbert, MN on a May 23,1911 when he witnessed a Petition for Naturalization filed by his brother Harry. He was subsequently recorded as living in Eveleth, MN on November 18, 1911 when he signed as a character witness on Benjamin Craine's Petition for Naturalization. At the time of the 1920 Census, Sam and Rae were living with Lillian Golda, Rosalin, and Shalby at 624 Jones Street, Eveleth. The family thereafter remained continuously in Eveleth until moving to Milwaukee in 1928. 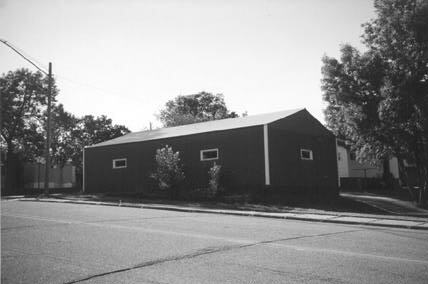 The photograph to the right is 624 Jones Street, Eveleth (taken July, 1998). Harry and Celia were married in 1913, and the following year, the couple was residing at 105 Grant Avenue, Eveleth (Petition for Naturalization, 12/3/1914). One year later, George Ellis was born. United States Citizenship was granted to Harry and Celia in 1916. (This poses a problem for the amateur historian because a series of very useful citizenship documents comes to an abrupt end.) Where the citizenship documents leave off, birth certificates kick in. Leah Golda was born in 1917. Another very helpful document was the 1920 Census showing the family renting at 618 Jones Street, a house they shared with William and Minnie Tobin and their infant son. The Tobins were also renting and taking in two lodgers, both schoolteachers. Sholen (Shimmy) Ellis was born on the range in 1920 followed by Helen R. (Babe) Ellis in 1924. The family departed the range for Milwaukee in 1927 or 1928. The picture is a recent image of The Fair Store operated by Sam and Harry Ellis in Eveleth (photo by Howard Bern). Sarah Reva Eliaschevitz was known to have been on the range since at least July 1, 1906, her wedding day. She married Morris Ladin of Chisholm, MN, a 1901 immigrant from Sveksna, Lithuania which was some 30 miles from Sarah's hometown of Yurberg. Laden, Sarah probably emigrated around 1902 (Bernard Laden, personal communication, 2000). Morris was occupied as a door-to-door peddler of dress goods and supplies. Ready-made clothes were not yet available on the range. (Sally Ladin Bell. The Ladin Family: Pioneers of Chisholm, Minnesota,Self-published, 1983.) Photograph to the right is Sarah Ellis and Morris Ladin. 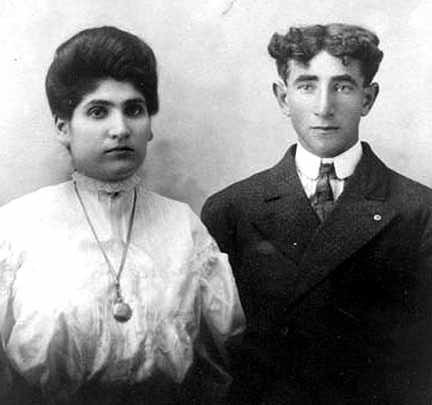 1908 is likely the year that Sarah became a United States citizen since a woman's citizenship was the same as her husband, and Morris is thought to have become a citizen in that year. The family soon thereafter moved to Kinney, Minnesota where a new mine was opening. Morris purchased the second lot sold in the town, the corner of Main and Maple Streets where he opened a dry goods store. 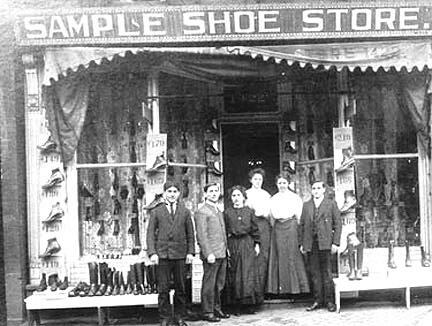 The family lived behind the store on Maple Street. The family was known to reside in Kinney as early as 1910 when Morris was elected a trustee of the town. Sarah's second child, Jeannette, was born in Minneapolis in 1909, but her two younger children, Lillian (1911) and Bernard (1913) were both born in Kinney, a distinction that few can claim. The picture to the left is Morris Ladin's store in Kinney, MN in 1914. The children with Morris are lined up left to right: Jeannette, Sadie, Lillian, and Bernard. Note that this picture is taken in the summertime (no snow). Also note that there is not a blade of vegetable matter growing. Kinney was not so much a town as it was a mining camp. Notice the incline on Main Street as it slopes down to the mine. Bernard sledded this street in winter. The family fortunes rose and fell with the economic activity of the mine, and the family moved to the neighboring town of Buhl in 1924. 1928 saw a move to Grand Rapids, MN at the headwaters of the Mississippi River, then Virginia, MN in 1930, and finally Milwaukee in 1931. The photograph to the right is young Bernard Ladin in his Grand Rapids High School years. During 1931-32, Bernard Laden lived with the Ben Bankman family in Virginia as he completed his studies at Virginia Junior College, before he,too, moved to Milwaukee to continue his education and to be with the rest of the family. 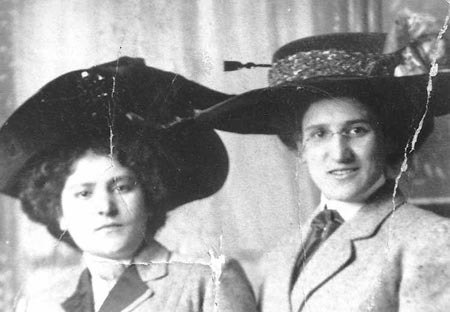 Jenny Ellis arrived in America with her sister Fanny and her mother Miriam (Mary) in 1907. 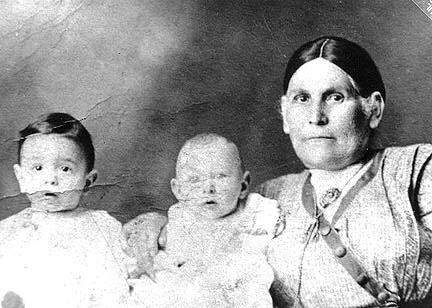 (Family Book, account of Leslie Bern) Two of her children were native Mesabi rangers. The picture on the right shows Jenny and Fanny. Fanny arrived in America in 1907. She and Max were married in 1910 and their four sons were all born on the range: Sanford in 1912, Howard in 1915, Leslie in 1920, and James in 1922. They owned and operated a butcher shop and lived at 301 Jackson Street, Eveleth. (Joel Alpert, personal communication, 2000) Fanny became a naturalized United States Citizen in 1925, the same year that she and her sons moved to Detroit. Reuven was the last of Mary Naividel Eliaschevitz' children to immigrate to the United States and to the iron range. Reuven arrived on the Kronprinz Wilhelm from Bremen on May 28, 1913 like his brother and sisters-in-law ten years earlier. Various documents uncovered by Joel Ellis at the Iron Range Research Center in Chisholm show an impressive range of spellings for both Rueven's first and last names. His signatures reflect the same bewildering array of spellings. Eliashiewitz, Eliashewitz, Elisajewicz all appear. Rubin and Reuvin are predominate, but his name even appears as Robert on a birth certificate for Meyer. 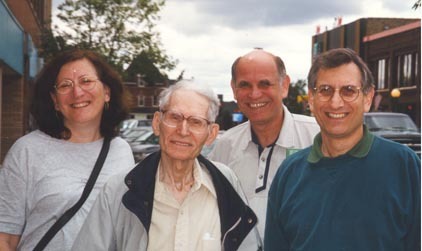 Reuven married Alta in Europe and they had four children all born in Yurberg: Solomon born 1907, Abraham (Max) 1909, Milton (Robert) 1911, and Jacob (Joe) in 1913. The family remained in Yurberg when Reuven came to the United States in 1913. World War I intervened, and it was not until after 1920 that Reuven was able to bring them to America. A naturalization petition dated July 24, 1920 showed Chia Faiga (Alta) and four sons all still in Yurberg. At last, Reuven's family arrived sometime in 1920 or early 1921. 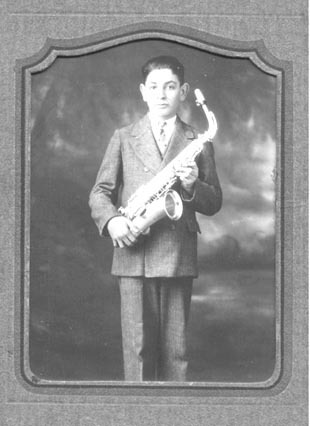 Reuven and Alta's fifth son, Meyer, was born in Eveleth on November 2, 1921. The family's residence at the time was 210 Grant Avenue, and Reuben's occupation was listed as "dry goods merchant." Reuben's name was erroneously listed as "Robert" Ellis on the birth certificate. Meyer was good-naturedly welcomed by the family as "Mr. America" as the only one of Reuven and Alta's children born in the new land and after a protracted struggle to emigrate. 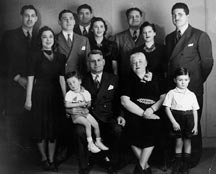 Reuven and Celia are pictured above with children and grandchildren. Brothers Sam and Henry Lippman and their sister Ethel lived on the range. Sam and Henry both appear as witnesses on naturalization papers (Sam on Harry Ellis' petition, 5/23/1911 and again 12/3/1914; Henry on Reuvin Ellis' petition, 7/24/1920). Each is listed as "merchant" living in Virginia, MN. Ethel Lippman became Ben Bankman's bride and the mother of Julius (1907), Pearl (1913), Jack (1914), and Sam (1916). Ben Bankman also signed as a witness for Reuvin Ellis' naturalization petition of July 20, 1920 and listed himself as a "merchant" residing in Virginia, MN. Bernard Laden, son of Sarah Eliashevitz, remembers the Bankman children all as brilliant students. He lived with the Bankman family in Virginia during 1931-32, his final year at Virginia Junior College (now Mesabi Community College)(personal communication, 2000). Others who apparently lived on the range included Ben Lippman who reportedly ran a clothing store in Hibbing (account of Rosalin Ellis Krelitz in the Family Book), but I have no documents about him. I do not know whether other Lippmans or Bankmans lived on the iron range. Documents show that Ben Craine came to the United States on the ship Grosser Carfirst on March 1, 1905. He sailed from Bremen, Germany on February 17, 1905 and disembarked at the Port of New York. He took up residence in Minnesota on February 5, 1907, and as of February 16, 1909, he was residing at 419 First Avenue West, Duluth, MN. 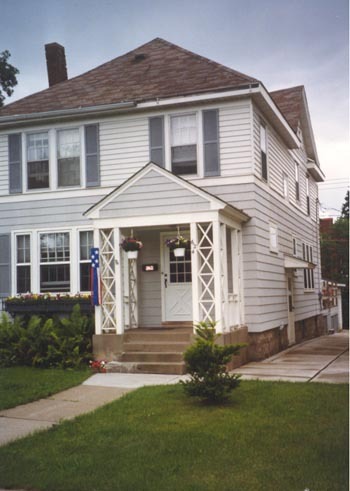 On May 23, 1911, Ben was living at 214 Maple Street, Virginia, MN when he petitioned for citizenship. He listed his occupation as "clerk." On March 16, 1912, Benjamin Craine was "admitted to become a citizen of the United States of America," having renounced allegiance to "foreign prince, potentate, state, or soveignty, and particularly to Nicholas II the Emperor of all the Russias." A notice from the U.S. Department of Labor, Bureau of Naturalization dated May 2, 1927 indicates Ben Craine's address as 246 Alexandrine Street, E., Detroit, MI. As of 1998, the only known relative still residing on the Mesabi range was Sam Bankman, retired physicist, living in Virginia. The Ellis family and their relatives from Yurberg practiced orthodox Judaism. They spoke Yiddish at home. Yiddish was not, however, the language of the mines, the schools, or the general community. Bernard Laden recounts that his oldest sister Sadie had to repeat kindergarten for lack of English language skills (personal communication, 2000). Keeping kosher was considered an important obligation, but it was a practical feat of endurance and devotion. Several shochet (ritual slaughterers) lived on the range in the larger towns. Bernard Laden tells of having to carry a live chicken purchased at a farmers market a mile or two to the streetcar station. He took the chicken on the streetcar to the shochet in Eveleth or Virginia to be properly dispatched, after which he returned home with the blessed chicken parts (personal communication, 2000). Leisure time was in short supply. Bernard Laden comments that he was not aware of any. Available time was spent on business, child-rearing, household chores, and religious observance. For children, there was baseball in the street in Kinney during the month or two of summer. Other summer amusements included chopping wood for the winter. In winter, there was chopping the ice off of the wood pile, and carrying wood into the house and carrying ashes out. Snow had to be shoveled and the fire tended. Winter was also the season for ice skating and sledding. Bernard Laden talks of sledding down Main Street in Kinney with no concern for traffic. There was none. Cars had to be propped up on blocks and all fluids drained for the winter. It was too cold and icy to operate a car. Morris Ladin had one of the first cars in the town of Kinney. Sarah Ladin had one of the first washing machines in Kinney. Homes were plain wooden structures. The Ladin home in Kinney was a four room house behind the store on Maple Street. It had a bathroom built on and was the first in town to have indoor plumbing. Other homes had outhouses. The house was illuminated by solitary unshielded incandescent bulbs hanging from each ceiling. A wood-burning stove supplied heat and cooking facilities. What became of the hard but picturesque life on the range? Why did these families who arrived with so much enthusiasm and against such odds decide to pick up and leave in the late 20's? Did the great depression arrive early on the range? Perhaps it did. Even in the good years, maintaining a store in these small towns was a risky proposition. The mines began to play out their easy pickings of rich hematite ore, and it was not until the 1950's that a commercially feasible means of processing the lower grade taconite ore was developed (aided by state tax concessions begun in 1964). Morris Ladin suffered a series of financial setbacks triggering a series of moves from town to town in the 1920's. The other Ellis families had all picked up and left by 1928. Was it because the children of the iron range pioneers were reaching their teenage years and early twenties and their parents realized that there were few social prospects for eligible young Jews? Was it because the immigrant generation had worked to make a better life for their children, and the better life was in the bustling cities of the Midwest? Following the 1998 Family Reunion in Minneapolis, I went with my sister Shirley Laden Marcus and my brother Ben Laden to visit the Mesabi range to see it with my own eyes and to attempt to make sense of a lifetime of tales of forty below winter days and open pit mines. Apparently, others independently had the same idea. Joel Alpert, his sister Niki Alpert McCurry, and her husband Alan McCurry also made the trip. On Sunday afternoon following the reunion, Shirley, Ben, and I drove up to the range and found a hotel room near Eveleth. On Monday morning we made a beeline for Virginia where my father had lived in 1930-2 while attending Virginia Junior College. In July, Virginia was a tired but substantial little town. Much of the commerce of the area has shifted to strip malls and warehouse shopping stores along U.S. 169, the main highway through the range. A giant loon floats on the lake downtown. On the shore is an old train station which has been converted to a bank building. We walked around the town and came across the public library where we whiled away a couple of hours reading about the history of the region and checking old city directories without intending to do any serious research. We did find Harry Ellis and Sam Ellis in a 1920 directory showing their Jones Street addresses. There is probably a quite a bit more about the family that might be discovered there. Kinney Main Street looking toward the old mine. From Virginia, we went on to Kinney, my father's birthplace. He had described to me how to identify the lot where the store (pictured above)was located. He said, "Start at the mine at the end of Main Street, and go two blocks. You'll see it on the corner." He had not been there in sixty-five years, but we had no difficulty in identifying the site on the corner of Main and Maple. Where the "Laddin's Store" once stood, there is now a simple garage. It is diagonally across the street from the firehouse which still stands but appears closed except for some town offices upstairs. There once was a theater on another of the corners at this intersection, but it is now gone. A boarded-up hulk of a brick storefront is directly across Main from the store site, and a stamp-sized post office stands next to it. This intersection was clearly the center of gravity of the Town of Kinney. There were only one or two other intersections to choose from. 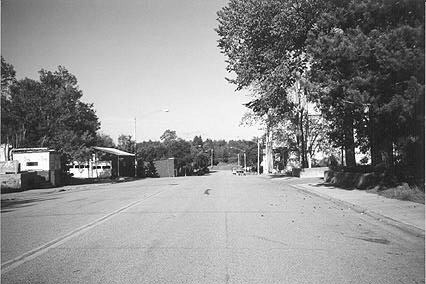 The picture shows the deserted Main Street of Kinney, MN looking downhill toward the mine (not visible due to reclamation). As we milled about the street marveling at the sights, we were the only people about. There were no other cars. The curtains in a mobile home across the street were pushed furtively aside and then closed. We ventured down toward the mine where a couple of one-story corrugated steel buildings housed a St. Louis County office building and the Kinney Public Library. Across the street from the library was the town's only business establishment, a bar. 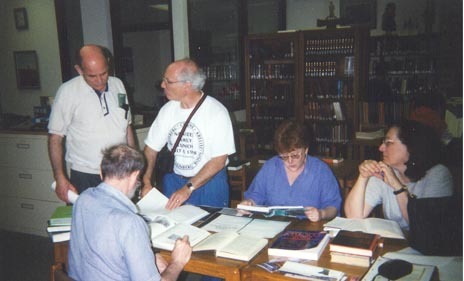 In the library, we found some townspeople, two men probably in their early seventies, who were pleased to tell us about the town. One was a Serb who had come to Kinney as a youngster shortly after my father left. He told of boom days at the mine when the town boasted of five grocery stores and five brothels. 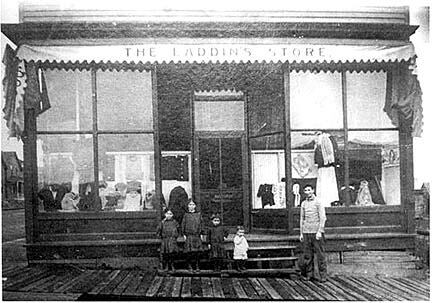 In an impromptu ceremony, he accepted from us on behalf of the Town of Kinney a copy of the photo of the "Laddin's Store" to be placed in the archives. The photo to the left shows a garage which now occupies the site of "Laddin's Store" at the corner of Main and Maple. We walked down to the mine which was long ago played out. It has now been reclaimed as a recreational lake and has the look of a pristine sylvan lake perhaps a third of a mile across and ringed by a pine forest. The town is invisible from the lake. From Kinney, we continued on to Buhl, a forgotten backwater little larger than Kinney itself. From Buhl we proceeded to Chisholm where we visited the Ironworld Discovery Center which is something like a theme park where you can ride an old railroad around an open pit mine. It is also the site of the Iron Range Research Center which offers a small but very interesting library set up to allow genealogical research on iron range families. The staff was quite helpful, and we spent a couple of hours there locating the documents that went into the preparation of this presentation. These included census lists, naturalization papers, voter registration records, newspaper accounts,and others. Ironworld has a website at http://www.ironworld.com/index.html. 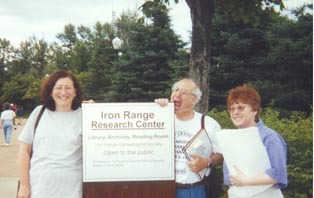 At left, Shirley Laden Marcus, Joel Alpert gnawing on a tough genealogical puzzle, and Niki Alpert McCurry at the Iron Range Research Center. In the picture below right, the team works to uncover mysteries of the past inside the center. As it had been a full day, we parted ways with Joel, Niki, and Alan. The following day, Shirley, Ben, and I continued our range tour in Grand Rapids. Grand Rapids, MN is probably not the Grand Rapids that you have heard of. That one is in Michigan. Grand Rapids, MN is probably not actually part of the range, either. It is too far west, but Morris and Sarah Ladin moved their family there in 1928, and my father attended high school there. In Grand Rapids, we found a nicely refurbished Central School that housed a few shops and a very small historical library. There we found a 1929 Grand Rapids High School Yearbook, "The Pine Needles," which featured a couple of pictures of Bernard Ladin including one of him in the orchestra. We found the old high school which had years ago been converted to a junior high school, and we walked across the bridge spanning the Mississippi River which my father says he crossed on bicycle. Our plan was to put together a package of brochures, memorabilia, and other jetsam from the trip and to mail them to my father with a hand-stamped "Kinney, Minnesota" postmark. We managed to get this package together and then raced to reach Kinney before the post office closed. Alas, we missed the four o'clock closing by ten minutes (though we were never sure that it was ever really open at all). We mailed it, instead, from Virginia. We returned to tour Eveleth. Eveleth contains a Hockey Hall of Fame and sports the worlds largest hockey stick and hockey puck located on a corner lot downtown. 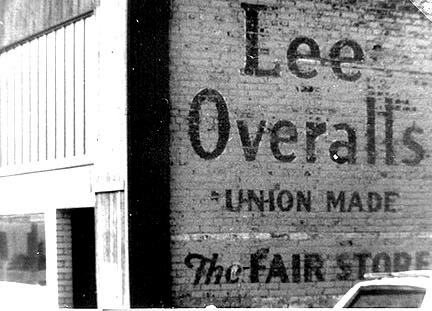 We located the site of "The Fair Store" and photographed the brick side wall with the name painted on the side. We weren't sure where the other Ellis stores were situated. We did, however, find and photograph 618 and 624 Jones Street, the homes of Harry and Sam Ellis respectively in the 1920 Census. Reuven also lived at 624 Jones Street for a time. Eveleth, like the other towns on the range, has seen more prosperous times. There were several empty storefronts downtown, but the Jones Street houses were freshly painted, cheerful, and in good repair. The yards were well tended, and there were colorful annual flowers on display and banners hung from porches. Some people are still finding the great Mesabi Range a good place to live.